The spy photos that splashed across the internet in the recent past may have divided our opinions in the Intruder 150. But now, after having a go astride Suzuki’s smallest cruiser cruiser to date, we can officially confirm that, after the Gixxer and Access 125, Suzuki has gotten yet another winner on its hands. Lets begin with the styling. There’s definitely a lot to take in with regard to this with the Intruder 150. It’s design is inspired by the traits of the larger hearted Intruders and everything is big about this bike - from the large halogen headlamp with a small fly screen up front, to the rather bulbous looking tank, the flared engine cowl, the huge seats down to the Busa-ishtail LED housing section. Those oversize exhausts tips though, are a bit of an overkill in our opinion and think that a sleeker, slender approach would have been a better alternative. The Intruder 150 has the presence of a much larger displacement capacity motorcycle, but underneath all its bulky panels lies the same 155cc single-pot air-cooled mill that we’ve come to appreciate on the more physically toned Gixxer. The motor produces 14.5bhp of power and 14Nm of torque and comes mated to a 5-speed transmission. The motor delivers enough torque low down the powenband for you to pull away from low speeds (around 20kph) in a a high gear (5th) and the best part is it does so in a smooth, composed manner, by single cylinder motorcycle standards. Essentially, what this implies that the Intruder has its cruiser engine and gearbox boxes ticked. Now if know anything about the Suzuki Gixxer, you’ll know that it has been an outstanding small-capacity motorcycles in its class and thereupon the reason Suzuki has chosen to base much of its tiniest of Intruders on its potent little streetbike. Aside from the engine, both motorcycles feature the same informative all-digital display, the same diamond-shape 17-inch wheels with 100-section MRF Nylogrip Zapper treads up front and a wider but rather puny-looking 140-section Zapper at the back. Even the Intruder’s chassis is based on that of the Gixxer albeit with a longer swingarm. Not the combination of all these bits may sound odd, but it all comes together quite well in the form of the Intruder 150 as we found out on a ride through Lavasa. As soon as you hit the road, you’ll know that its a small capacity motorcycle, but not in a bad way. Its all down to the weight and throttle response. The Intruder 150 will have you state in a traditional cruiser riding position, with arms and even your feet stretched forward to meet the bars and the forward-set pegs. The seat is broad and very accommodating, but is soft, which may prove a pain to deal with on long stints in the saddle. Also, tall riders may find their knees hitting the bars a little too often while taking turns with the current stock setup. The motor has decent enough pull to get you up steep inclines without too much worry, as my photographer and I can confirm. The tyres may not appear to be the best choice visually, but when it comes to their function the treads and even the disc brakes setup work very well with this motorcycle. What’s also impressive is the fact that the suspension allows for a very comfortable ride - taking out the sharpness of bumps on the road. The bike comes equipped with ABS on the front brake, and though we found that to suit the purpose immaculately, we’re sure that there are a lot of people (who are solely inclined to employing the rear brake) may not. 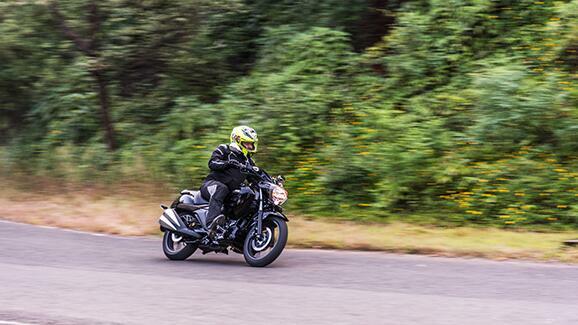 Show the Intruder 150 some curves and you won't be disappointed with the way the Suzuki handles matters either. even with a longer wheelbase than the Gixxer - whose chassis the Intruder’s is based on - 170mm of ground clearance, which is a big plus given our road conditions. With all it brings to the table, the Intruder 150 comes across as a mighty sound 150cc cruiser package. The levels of fit and finish, like the quality of paint, is really good too. With its over-the-top styling and features, at a price of rs 98,340 (ex-delhi) sounds like a good deal. Should the Bajaj Avenger 150 be worried? We definitely think so. But confirmation of that judgement we’ll reserve for another day. Verdict: Move over Gixxer and Access, there’s a new Suzuki hot-cake in town.